In a recent post Brett discussed evoking emotion and the complications with using faceless toys to convey any kind of feeling. A particular point he made that fired my thought process was the common adage: “the eyes have it”. They are the window to the soul. Now although Brett was discussing a lack of eyes challenging his creativity his post took my brain went to the flip side and I considered my toys that did have eyes; those soulless, dead plastic eyes. I read an article a little while ago, unfortunately I cannot remember when or where. But it was probably something to do with cinematography, it might have even been a Youtube video essay (I have fallen down that rabbit hole recently, I watch a lot). In this article, blog post, video there was the explanation of the use of “catchlights”, used to an effect to manufacture a soul in movie, photography or imagery. This is where lights are shined into the subjects eye to add a sparkle or highlight. The idea is that if an eye is a reflection into one’s inner self having actual reflections in them stands as a pretty solid metaphor. Also from both an anatomical and a portraiture point of view an eye is three dimensional, it has depth and having highlights with in an image of the eye accentuates this and brings it to life. 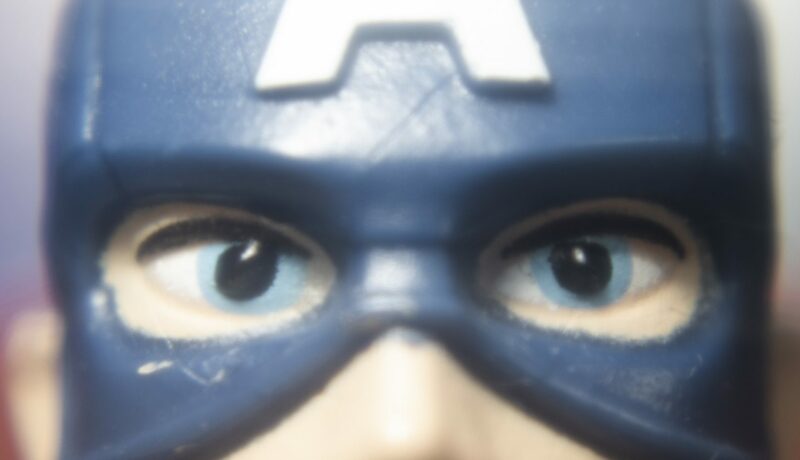 Coming back to toy photography this got me wondering what the eyes on my toys looked like. I was aware of some of my newer Lego minifigs have painted catchlights in there eyes, and with a little research it seems this trend came in with the original Harry Potter range in the early 00s. My action figures on the other hand all looked rather lifeless. So how can I remedy this? I thought about painting them on but was concerned about the finite positioning this would lead to. If you’ve seen any of my other photography you’ll now I have an inclination for practical effects and this thought process reminded me of the scene in Toy Story 2 where the Geri the Cleaner fixes Woody; specifically when he polishes his eyes. Raiding the cupboards at home and trying various substances from waters, oils, vaseline and more I’ve been trying to give the eyes a glossy coat. I’m currently working with a cosmetic blur primer to give that sheen, seemingly giving the best purchase but without permenance. I’ve been working with the Disney Toybox range due to their eyes being that little more emotive and a touch larger than your typical 6 inch scale figure. Applied with a cocktail stick to get detail with the cosmetic primer hopefully I’m adding a little bit of soul back into this figures faces. Do you have a project you’re working on that you would like to share on the blog? If so, please our contact form and tell us all about it. We may want to feature your work on the blog. Great post Tom. Nice to see some soul in those lifeless plastic eyes! 😉 I really like the Leia shot. Thanks Lizzi. I’m pretty happy for a first attempt, but now I think it’s time to add the effect into some more elaborate shots. Sorry to hear about your Jessie woes. Great idea, Tom! I’ve added catch-lights to certain images, and it definitely added some life to the figures. But I really like the idea of a practical effect, and a more lasting solution. Adding a shiny coating might be the ticket. Thanks Teddi. I’ve taken the option to try and create as much as possible in camera with practical effects. I find it a really engaging process in pushing how far I can go with a camera rather than what I can create in Photoshop (not that there is anything wrong with that). I went with a non-permanent solution this time just so I can wipe it off and start again if I want. As someone who also believes that the soul is reflected in the eyes, this post really resonates with me. LEGO is so shiny already, Im not sure a practical solution would be applicable. But I think I may try this the next time I take the raptors out for a photo session. I think a little gleam in the eyes would make a huge difference. Thanks for sharing! Thanks for letting me share. As I mentioned it was Brett’s post that got me thinking. But rather than the lack of eyes how can you make actual present eyes seem more lifelike. It’s a bit of an effort to paint on the primer with the end of a cocktail stick through a magnifying glass, but I’m happy with the results. I suppose we have to suffer for our art. Good luck with the raptors.